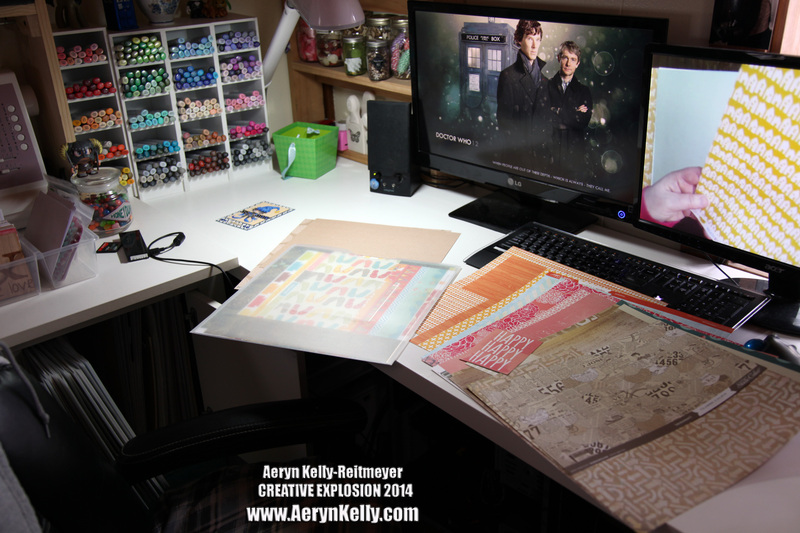 Aeryn's Creative Explosion: Studio Monday: Kit Commotion! With the Scrapbook Expo coming in 19 days, and me planning to spend craptons of money... yeah, I had to re-evaluate my paper stash which isn't like huge but still not good to add without making sure I can use what's there. There's a gal on my message board (not mine, just the one I frequent) named Margareta that runs a Scrap Stash Kit Club. The idea is not to buy more things with a subscription, but to make kits based on her colour choices/theme from your own supplies. I've watched for a while but not participated because I've always just wanted to buy her kits instead! That's not really how it works, but I wanted to take the cue and run with it to use up some of those papers that have been sticking around for more than six months. I decided not to make the *full* kits, since I don't store my supplies like that, but just focus on the paper for now and when I use something from the kit I can look at the "official" picture and go from there with inspiration. Here I am, putting together a kit. I went through my paper cube (that's it on the bottom left) and as I looked through a Page Planner envelope of paper I pulled it out a bit, cuing myself that I'd done it already. I looked through everything, every time, just to make sure I had the right shades and whatnot. Margareta put up some videos for her kits, explaining her paper picking ideas, so I watched a few of those while I did this. The first kit I did you saw the product of on Sunday with the "let it snow" card. I went with the Going For Gold kit since it was like first or something. It looked first. But since I don't have any gold, I had to do yellow. For this one I followed the Miss Sunshine kit, adding some brownish just for the hell of it. She had a Pantone paint chip for the Something Blue kit here so I followed that. I kept it simple for the Summer Nights Kit because I didn't really see how some of the pieces fit into the kit. I've been making huge kits so far, so it's nice to have something small to work with. I have a surprising amount of black, and this is a blackish grey. For the Autumn Twist I went really autumn with it because those were just the papers I found. ((shrugs)) I think it will work for boyish layouts or cards, yeah? Since I already have a ton of actual autumn papers. This kit is the one that I really would have bought if Margareta had them on offer. Even with all the letter stickers in there, I love the look of the Pop Up Kit so much. I did my best to re-create the kit as best I could and then when I use it I hope I can find the proper embellishments and stuff. And the very last one is this month's Jackpot kit. Her version came with a lot of rainbow, but not many solids to rest the eye on. So I combined tan/white, black/white, and grey/white pieces with the remaining rainbow from my Glitz paper pad from last January. Yeah, it's time for that to go. I'm not fully acquainted with kits, and I know I made some of them HUGE so they'll take a while to use, but I'm feeling better about my paper stash and my ability to use it. I also think I ended up getting rid of a few paper envelopes and combining others as the papers dwindled to scraps. That's always good. This is really new for me since, you may have noticed, I don't really tend to combine paper companies/lines. I've always scrapped along manu/line, but I'm willing to give this a try! 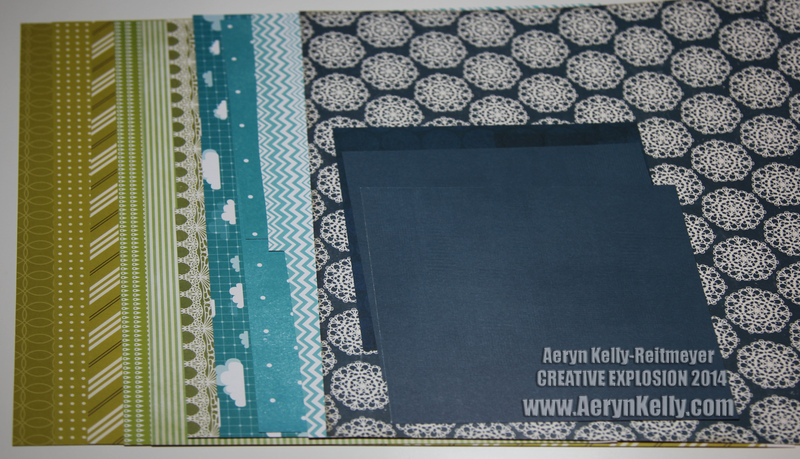 I've added a tag for Stash Kit to my side bar so you can check out what I make with these kits. Thanks for coming by, and I hope I've inspired you. I think kits might be a fun way to rejuvenate some of those papers that I don't know how to pair! I wish I could go to one Scrapbook Expo...I had so much fun last year ! Good for you to make these kits, I'm sure you will use them soon. I love the Scrapbook Expos for the shopping experience. 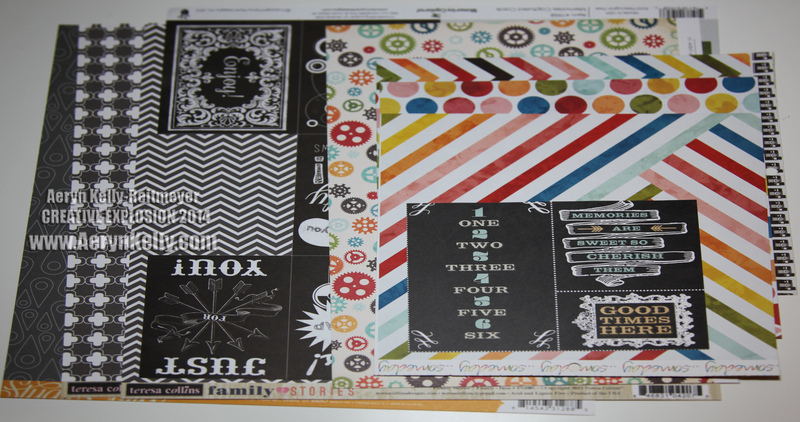 I find myself missing being able to have a place to SEE scrapbook supplies! But I'm sure you know how that is. Well, the Expo isn't until the 22nd of March, but I'm sure I'll have a good time. I try to go to at least one every year, but I'm lucky enough to have four within 2 or 3 hours of our house. I'm sorry yours are so far from you. Well, I guess if you've already done your CHA spending you can hardly be blamed for skipping it! I'm fighting tooth and nail not to place a huge online order! I'm glad you like my kits; I hope they're easy to work with! Your kits look totally wonderful! Love those papers! (Yeah, I know I picked the color combos, but I still think they look awesome! LOL!) Thank you so much for playing along! :D Can't wait to see what you'll create from these. Thank you, Margareta! I'm glad you like them and I'll be sure to try and pin whatever I make too so you can re-pin. What is this budget you speak of? I have no budget. I *do* have a shopping list though! I'm glad you like my kits, it should be interesting to colour to them so I can use them for scrapping *and* cards. those are some great kits! Thank you, Bev. It took a surprisingly long time, lol!